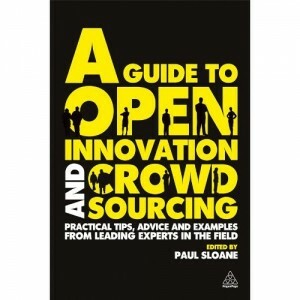 We are pleased to have contributed a chapter to a new book called A Guide to Open Innovation & Crowdsourcing, edited by Paul Sloane which is launched this week. Paul has done a great job of pulling together contributions from pretty much everybody who’s anybody in open innovation globally, and whilst I haven’t had a chance to read all of the other contributions yet, it looks like a really useful book that I’d recommend to you. Our chapter is called ‘Start at the End’ and is underpinned by the premise that, in our experience, the most successful open innovation programmes that we’ve been involved with have had a very clearly defined end point agreed up front – both in terms of time and resources, but also in terms of the collaborative business model on offer. Whilst it takes time to get all of the pieces of the jigsaw puzzle agreed up front, it comes in extremely useful when it comes to ‘going open’ and enables you to build momentum around a new collaboration, rather than shift the goalposts once you’ve found something or someone of interest. Anyway, there are also contributions from Henry Chesborough, Stefan Lindegaard and Andrew Gaule to name but three, as well as Paul Sloane of course, who in pulling together the people and contributions to this book, has created a network of people that I hope will achieve much more than just shift a few copies of the book. Having said that, we’d be delighted if you wanted to buy a copy, and in which case it is now available from Amazon here. And if you do buy a copy, thank you and do let us know what you think.